According to Duncan Castles of the Daily Record, Real Madrid are back in for Manchester United goalkeeper David de Gea. One would have thought after signing Thibaut Courtois from Chelsea last season that Madrid’s pursuit of De Gea had ended but after returning as manager, Zinedine Zidane was quick to drop the Belgium international for Keylor Navas in their 2-0 win over Celta Vigo. There are also growing concerns about De Gea’s contract negotiations at United. At one stage, it looked like his long-term future was certain to be at Old Trafford, but now United’s executive vice-chairman Ed Woodward has refused to meet his agent’s demands to be paid as much Alexis Sanchez. United, however, are still offering a deal that would make De Gea the world’s highest paid goalkeeper. His current contract expires in 2020, leaving him free to sign a pre-contract agreement with one of his suitors next January! 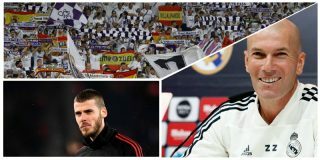 Madrid will be made well aware of the discontent at United’s negotiating stance, so they could try swing the situation in their favour. Hopefully Woodward can get this deal finalised before it’s too late. Everyone at Manchester United believes De Gea is the best goalkeeper in the world and the club must ensure he signs a new deal at this point.